Ten Ren Tea's Spring Tea is a special selection of "Green Oolong" that is delivered fresh from this year's spring harvest and has been judged worthy by Ten Ren Tea's tea experts to be this year's Spring Tea 2018. We feature this type of tea once a year and in limited quantities. Each year the tea comes in a beautifully designed collectible canister. Each canister contains 7.9 ounces (225 grams) of the freshest Green Oolong. Harvests during the spring and winter seasons yield a higher quality of Oolong than during the rest of the year. 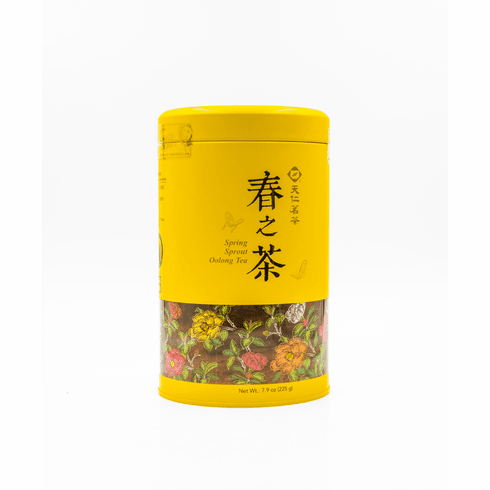 Many of Ten Tea's customers eagerly await for the release of this tea every year and now it is available in limited quantities. When steeped the tea has a light yellow color with a pleasant light floral aroma. The taste is smooth without the bitterness or bite and lightly sweet aftertaste. The water used to steep this tea should be about 185-195�F or 85-90�C. Use about 2 teaspoons (3 grams) of tea leaves for about every 5 ounces (150 milliliters) of water. A steeping time of about 3-5 minutes is recommended with more or less time is depending on the desired concentration. As a rough guide, the higher the temperature of the water or the greater the amount of leaves used, the shorter the steeping time should be. The tea leaves should uncurl for full flavor. For the ultimate enjoyment, a traditional Chinese Yixing teapot is recommended for loose oolong tea. The teapot should be half filled with leaves and initially steeped for 45 seconds to 1 minute with the steeping time increased by an additional 15 seconds for each successive steeping. The leaves may be steeped multiple times. Net tea weight 7.9 oz (225g) and shipping weight is 0.90 pounds.